As a company dedicated to bringing you the very best accessories designed to support your passion for Essential Oils, SOLIGT is proud to offer yet another innovative product perfect for home or professional use. 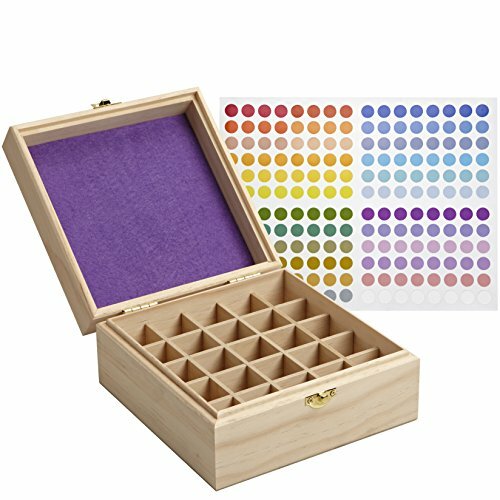 Beautifully crafted and exceptionally practical, our Wooden Essential Oils Keeper Box is the perfect way to store, protect and display your collection. This is a handmade item done in natural unfinished wood---a design that evokes simple harmony. It is lightweight and compact, complete with 25 slots to hold your 5ml, 10ml, 15 ml and roller bottles. We have included a built-in cushioning sponge on the floor of the box to keep bottles more secure and reduce noise. And as a special gift compliments of SOLIGT, the Essential Oils Keeper Box comes with custom-designed color labels for keeping oils neat and organized. Our Essential Oils Keeper Box makes a truly thoughtful gift and is a wonderful solution for holding DoTerra, Young Living, Rocky Mountain, Native American, Organic Infusions and Aura Cacia products. Product Size:18 x18 x 9.8cm,7.125 x 7.125 x 3.875inches. Inner Diameter:16.4 x 16.4 x 8.9cm,6.5 x 6.5 x 3.5 inches,6.5x 6.5 x 3.5 inches Per Slot. Also in the package, there are custom designed multi-coloured labels so you can organize your essential oil collection efficiently, just something we do for our customers to get the best experience from us. If you have any questions about this product by SOLIGT, contact us by completing and submitting the form below. If you are looking for a specif part number, please include it with your message.